Could Your Diet Coke Habit be Affecting Your Fertility? According to a new study, drinking soda regularly could mess with your fertility. Does that mean you should put down the can if you're looking to conceive? Chances are, you've tried (and failed and failed and failed) to drop your soda addiction, only to find yourself hankering for a carbonated, caffeinated drink a few times a week. 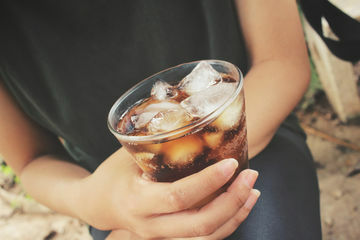 But if you're looking for yet another reason to break up with Diet Coke, this just might do it: A study to be presented at the American Society for Reproductive Medicine's congress in Salt Lake City suggests that frequent soda consumption might be reducing your fertility. Researchers from Federal University of Sao Paulo observed 524 patients and found that artificial sweeteners—the kind you'll find in diet soda—were linked to lower rates of implantation in IVF patients. And before you tell yourself that regularly sweetened sodas won't have a similar effect, hear this: Researchers found a link between the sugar added to regular sodas and poorer quality of eggs and embryos. It's not just soda either—you may also want to cut back on syrupy coffee drinks, as both real sugar and artificial sweeteners added to them can have similar effects on fertility. Sorry, pumpkin spice latte devotees! Researchers focused on women who were undergoing IVF for the purpose of the study—so if you're looking to conceive without fertility treatments, this might not quite apply to you. With that being said, we're going to echo your mom's advice: Soda isn't exactly doing your health any favors, so it might be smart to limit consumption even if you're not undergoing IVF treatments.